Let�s face it, when you go to Pepe�s you expect a quality pizza. You know your pizza will contain top quality ingredients. You expect the pizza to be well cooking in a coal fired oven. You know you are in a for a positive pizza experience. So when 11 members of the official Pizza Therapy Taste Testers descended on Pepe�s we were expecting nothing less than a high quality pizza experience. And Pepe�s did not disappoint us. Because of the diversity of the group (both ethnically and ethically) we decide on three different pizzas. 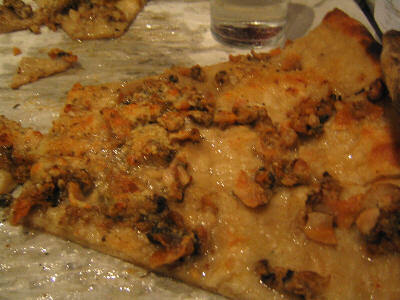 For the seafood lovers (hey, everybody in the group was a seafood fan), we ordered the original clam pizza. This was Frank Pepe�s signature pie. Hey, Frank Pepe invented the clam pizza. If the standard clam is not made with �mootz� (mozzarella), just a sprinkling of parmesan. The pizza just oozes with clam taste. You won�t find cherry stones or staemrs on this pie. This pizza is made with fresh quahogs. These are big, juicy clams, found in New England waters. Overcook these babies and you get a tough rubbery mess. If done just right the clams seem to jump off the pizza into your mouth. Next for the wannabe vegetarians, we ordered the original tomato pie. This is a plain pizza with cheese. The rationale her was to let the taste of the crust to shine through. Our third pizza was a loaded to the brim bacon and sausage pizza. Strips of hearty Italian bacon are mixed with a nice Italian sweet sausage. Due a miscue, our server brought out our first clam pizza with mozzarella on it. Not what we had ordered but we were given the pizza anyway. Everyone was pleasantly surprised. The taste of the mozzarella blended well with the clams. Everyone gave this pizza a positive review. The original tomato pie was excellent. Indeed the taste of the crust came shining through. The vegetarians of the group felt this was a perfect blend of sauce, cheese and crust. The original, original was in a word outstanding. Out came the bacon and sausage pizza. The bacon strips were thick and meaty. The sausage had a pleasant melding of meat and spices. The pizza was finished in an instant. Finally our clam pizza (sans mozzarella) appeared. I was not only a visual delight but the taste was just incredible. No one and I mean no one can match a Pepe�s clam pizza. Sure many have tried to recreate it, However, the taste of this pizza is beyond description. Simply amazing. It was interesting to compare and contrast the taste of the two clam pies: one with mootz, the other made without it. While I won�t be ordering it anytime soon, it was nice to be able to contrast the two very different pizzas. Again, Pepe�s did not disappoint. We all will be going back soon.